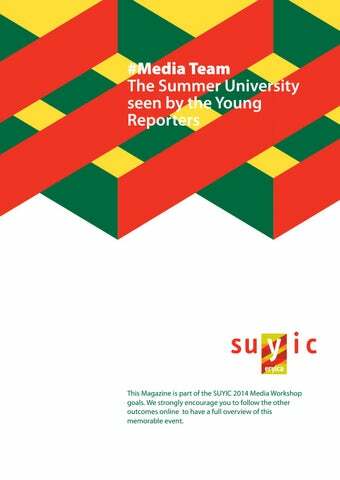 This Magazine is part of the SUYIC 2014 Media Workshop goals. We strongly encourage you to follow the other outcomes online to have a full overview of this memorable event. The views and opinions expressed in this magazine are those of the individual authors and does not reflect the views and opinions of ERYICA or of its partners. by Soraia Ramos Freelance Journalist and International Media Trainer Portugal It’s all about the future #United colours of Diversity “Put yourself in someone else’s shoes”, the starting exercise of our Media Workshop The Youth is the #Future and the Young people and the Youth Workers are a very important part of what will be the future and the way t youth information is spread. New techniques, new journalism approaches, new models and methods of communication are the base for the development. There is no development if it’s not shared and lived by the communities. The Summer University on Youth Information and Counselling #challenge started several months before the event. Gathering together skilled #Young People from #Europe and #Africa willing to #learn more about #journalism and to #practice #reporting even during the event, was an amazing idea. #ERYICA selected these outstanding Young Reporters, and here is part of our #outcome. #Creativity, Trust, #Helicopter View, Questions & Answers, Titles and Deadlines are words that now have a new journalist concept to this amazing group. thing for everyone who has this kind of website is to make sure that their website is responsive and accessible on smartphone.’ These tips can surely help everyone in the youth information field that are not sure how to effectively engage media in their work! However, talking about young people, for them to search for the information online can be rather confusing. A volunteer and a multiplier of Euredesk Lithuania Ingrida Jotkaite shares a rather unpleasant experience: ‘I found a new ‘Erasmus+’ page on one of the social media sites. I read the description and was shocked – it presented the program as some sort of travel agency. It was written there that with ‘Erasmus+’ you can travel in Europe and get 70% of your fees covered. Everything that was written in there was a big lie. However, almost 2000 people joined this group in one night! The worst thing was that even people, who work with youth and are aware of this program, still joined the group. I left a comment on the page, telling people that this all is one big lie, but instead of being ashamed, the admins removed me from the group and I was blocked, so I could not spread the truth anymore.’ Therefore, everyone must be very careful when searching for the information, because even the most attractive-looking posts might be just pulling wool over the eyes. Hence, it is very important to understand that there are so many ways to provide youth information in an attractive and easily accessible way that young people will surely appreciate. However, we should all keep in mind that in this digital information age, it is also very easy to get confused and lost. Next time, when we give young people some information, try to imagine ourselves in their shoes for one second. And, young people, let’s give some feedback for the pages that provide reliable information, so they would become better than they already are! African reality as well as European. In fact the differences are huge, but when it comes to the youth in general, I must say that we all agree, “Young people are a resource, not a problem – they are the present, not just the future”, and, as many argue “conscious and organized youth modifies the essence of a Nation”. I agree, no matter whether it’s June 18th or whenever. this. And I could not miss, animated intercultural nights where I was given the opportunity to experience different types of music, dance, food and fun. In the background, to see specialists and inspiring people so motivated makes me realize that I can also move forward, even if people say otherwise, only each of us knows our reality. From now on, I will take things more seriously because the end of the tunnel became light during my participation in SUYIC 2014, and the fire of motivation rekindled in me. Dear roommate, I hope everything is well with you. You were not here, but I hope to make you feel like you were. And this is how you get a taste of what I felt during this week. complicated matters. It needs to be monitored and the trained youth need to have comeback days so that they still have the up-to-date information. They need an organization or mentor to go back to if they need help or the issue is too ‘big’ for them”. In conclusion, peer to peer is a very productive method for young people that youth information workers sometimes cannot reach. We should work the different techniques in peer to peer youth information to know which is the most appropriate for each organization and country, but always providing quality and updated information, taking into consideration the risk factors we face. With the Summer University bringing together 120 participants from 34 different countries across Europe and Africa, it provided the perfect opportunity to highlight and discuss a key issue in today’s society; sexuality and identity. According to statistics, there are approximately 700 million people in the World who identify themselves as part of the LGBT community. stressed suggestions for future improvements were; to make LGBT young people feel safe and unafraid, provide more information on their rights, to challenge intolerance, stereotypes and negative thinking, to provide quality education on sexuality and human rights in schools, to make changes to laws allowing equal rights for members of the LGBT community, and to actively involve the LGBT youth in events and decision making. Whilst some of these ideals are unachievable currently, it certainly provides a target to aim for. European laws could be passed to address some of these issues. However, the problems are more country specific, and so it is down to the national governments, and regional councils, to identify their own nation’s issues regarding the LGBT community, and develop a step-by-step plan to address these issues. This NGO’s main goal can be well described by the slogan “Reclaiming the Future of Young People in Africa and Beyond“– but how is this done? Education, human rights and, in particular, women´s rights are the focus of this NGO. Mrs. Ssebakijje knows from her own experience what the problems of young women in Uganda are: empowerment – young women often don´t have the ability to analyze situations; gender violence, HIV/Aids, and, first and foremost, the issues of teenage marriage and teenage pregnancy. diversity across the continent - stretching from Western Africa (Guinea-Bissau) over islands (São Tomé & Príncipe) to the Eastern part (Burundi, Kenya, Malawi, and Uganda). Young people worked on various topics concerning the youth sector. The participants included representatives from National Youth Councils and presidents of NGO´s as, for example, Mrs. Annabelle N. Ssebakijje, currently active in the youth field in Uganda as the founder and executive director of the NGO “The Remnant Generation Ministries“. supposed to really be a pilot center in Uganda, a meeting point for reliable information and support for young people. After all, the aim is to spread information and provide counselling to the Ugandan youth – and, in particular, to young women – because young, empowered women who can actively shape their lives are an important part of Africa´s future. have greatly improved in Africa over the last few decades, approximately 40% of Africans over the age of 15, and 50% of women above the age of 25 remain illiterate. be heard and respected, desire to improve and discover their personalities, to find a world full of opportunities and to use these properly. That appears to be considerable differences, doesn‘t it? The distinction without a difference, isn‘t it? Despite all of this, different education and development levels, financial support and economic business, disparity in the way of thinking and appearance, the same youngsters live on the earth. Now, it is your turn to imagine. But if you want to become a professional dreamer, you should find someone with a different imagination first. Production of national legal frameworks for elimination of Gender Based Violence (forced marriage, female genital mutilation, sexual violence, etc.). growth of young people within their world, giving them capabilities and opportunities not only to develop with favorable conditions, but they are protagonists of their lives. Give the service information and advising seeks to educate young men for their effective freedom in the political, social and economic dimensions. Creating Centers Counseling and Screening for HIV / AIDS funds and community awareness about the form of contamination and prevention of STIs; and Educational policies; among other advances. At the refolding of more efforts in human rights sectors with mechanisms for prevention and punishment against their violation, with the creation of basic education and basic conditions for effective outreach to young people, the economy with the development of strategies and policies produced to give sustained and sustainable jobs for young people, which combats extreme poverty, hunger and misery that affects chances of thriving growth of the young population. “Nobody is born, grows and lives in a society without freedom, where rights and guarantees, peace and prosperity are unknown”. God bless Africa, Europe, America, Asia and Oceania where young people can grow, live in freedom and happiness in their continent and in context with all the rights assured and accomplished. Two continents, Eight reporters, two trainers, two challenges during #suyic14 to learn the theory through the Media training and to practice reporting, on the spot, in the event itself. Our main goal was to learn more about media, audiences, journalism and to report the event, creating buzz about this ERYICA Summer School on Youth Information and Counselling, in Braga - Portugal. can have contact with others, in order to collect information during their activities, defining a link to other actors in the field. There should also be a youth policy for supporting young people’s activities because only they can know what young people really want, wish and need, and how they work within the bigger picture, without judgments. They can influence youth policy so as to inform young people about ways to participate, to support advocacy actions, visibility of youth activities, collect and analyze youth needs in different areas of youth policy. Indeed, we can measure this in youth projects and working together with young people. In order to achieve that, we are proud to have successfully accomplished several results: •	Social media – we were everywhere: Facebook, Twitter, online articles, quotes, photos, videos, Storify, etc. •	Facebook –a considerable increase in the likes and followers in our Summer University page, hundreds of posts, pictures and short videos, thousands of clicks. •	Twitter - related with the events, quotes, photos and links connected with the #suyic14 topics, increasing the number of followers that will remain connected to ERYICA even after the event, because the Twitter account was not created specifically only for this Summer University. •	Daily Storify to resume the most memorable moments of the SUYIC posted online, presented by our team to the participants on the panel, in order to create awareness of our work, but also to make them feel commited to post and share it with the world. •	This small magazine, with articles written by the young Reporters, with their own perspective and personal approach. •	The knowledge earned by the theoretical workshop part, about Journalism, Public Relations, Audiences, Social Media Importance and different realities in the World, Feedback, Tips and Tricks to write articles and the differences on mainstream Media and Social Media. •	Help creating and distributing Press Releases and •	News Production on national and international media outlets •	Articles made by partner organizations worldwide before, during and after the event •	Definitely: a lot of buzz has been created by this event •	And a lot of hashtags that will remain forever connected with this outstanding SUYIC. 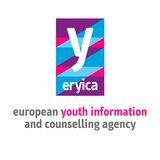 Conclusion: The investment on social media made by Young people was worth it on the spot and is also a long term investment, because it will remain online and as a portfolio to ERYICA and its partners organizations. Thank you for the opportunity and for choosing this international and skilled team.